Carole Matthews, Sohpie Kinsella and Belinda Jones – three of my favourite authors… It’s that time of year, where people are flying around the supermarket buying sun tan lotion and shorts and bikinis and those little tiny travel-sized bottles of shampoo and deodorant to take on their hols (which I really like, because they’re cute, but I end up taking 5 bottles of shampoo and may as well just have taken a normal size one). And, of course, a few books to read on the beach or by the pool (whether paper-backed or ebook). What’s the ideal holiday read? For me, it has to be a light read, something I don’t have to concentrate a lot on, something that makes me smile, something that has me liking the characters and enjoying their company on my holiday. I don’t mind a little bit of seriousness, but the books needs to have an equal share of ‘light’ moments. So, I’ve narrowed it down to three favourite authors – I’ve read most, if not all, of their books and have loved every single one. And, if I can only be 10% as good as they are, I’ll be a very happy writer! Carole Matthews – if you haven’t read any of her books, then I absolutely insist that you do, right this minute. Ignore anything else you’re doing this Bank Holiday Monday and go and get a book, or download one instantly. INSTANTLY, I TELL YOU! They’re fun, light, real and a joy to read. Plus, she’s a fellow Milton Keynes based writer, and likes cake. Take a look on her Amazon page – I can’t even recommend one in particular, as I love them all. But, there’s a couple that I perhaps remember more than the others and that’s because they involve the main character starting up a business; Calling Mrs Christmas (yes, it is Christmas based so it may be worth holding on to this one until a festive holiday) and Summer Daydreams. Carole really values her readers and has a great relationship with them – she organises trips and outings, and regularly runs competitions to win some fab goodies. Sophie Kinsella – Oh, I adore Sophie’s books. I laugh out loud (or LOL as the kids would say and, may I point out, I’m really down with the kids …) and they really tickle me. The main character in the Shopaholic series, Becky, is very annoying but it’s what makes her so fun to read (and my main character Lou is very annoying in Friendship, Love and Apple Tea, so I think she was influenced by Becky’s shenanigans.) I still haven’t read the latest one, I’m saving it for my hols in August (we all know that will never happen as I’ll have read it by next week). Give yourself a giggle and take a peek if you haven’t already. Belinda Jones – I started reading Belinda’s books a few years back and fell in love with them. Mainly, I think, because of the travel element. They’re set in great places around the world and are a cross between a novel and a travel guide. And, as a fan of travelling, that’s really my cup of tea. It’s probably influenced my own writing, as I wanted the reader to go on a journey with my characters and experience different places in the world, or revisit their own favourite destination. If you’re not having a foreign holiday this year, then give these books a read. You’ll find yourself travelling the world but without the cost or the sunburn. And you won’t need to sort out someone coming round to feed the cats whilst you’re away. Sorted! What’s your favourite holiday reads? Let me know and I’ll put them on a blog. And, if you haven’t done so yet, give my ‘Friendship, Love and Apple Tea’ a try… you’ll get to spend a few weeks in Turkey in the sun without having to buy a visa. Paperback Book Launch 25th October 2014! The Autumn weather is here, and the summer seems a distant memory… so why not get into a summery mood by coming along to a Turkish themed book launch! Yes, the date is set – 25th October 2014 and will be held at the Grill Med, Milton Keynes from 7pm. 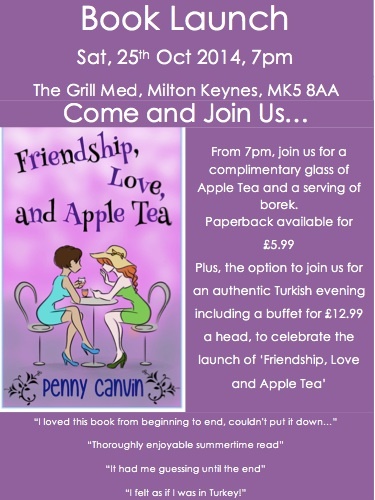 Join us for a complimentary apple tea and borek, and take the opportunity to purchase the paperback for £5.99. And, why not make the most of the beautiful food on offer and stay for the Buffet offered by Ali and his family for £12.99 per person. If you haven’t been to the restaurant before, give it a try. It’s one of our favourites. Click here to find the Grill Med’s address and Google Map. See you on the 25th Oct! yay! Author PennyCPosted on October 13, 2014 Categories GeneralTags Author Events, Book Launch, Marmaris, Turkey, WriterLeave a comment on Paperback Book Launch 25th October 2014!